Make our Creamy, Cold Tortellini Salad with just 15 minutes of prep time! 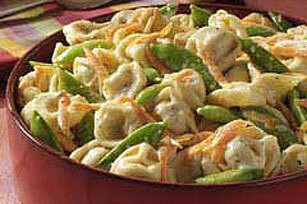 Learn how to make this cold tortellini salad with fresh spring veggies today. Combine dressing mix, mayo, vinegar and water in large bowl. Add remaining ingredients; toss to coat. Cover. Substitute MIRACLE WHIP Salad Dressing for KRAFT Real Mayo Mayonnaise. Save 50 calories and 6 grams of fat per serving by preparing with KRAFT Light Mayo Reduced Fat Mayonnaise.